What do school principals do when they retire? Well, they go out for lunch a lot! Ken is enjoying being stress-free and with his new found nearly empty schedule, he is making the rounds of all the fun sounding local dining establishments at least once a week. His lunch date is usually my not quite retired yet (but wants to be!) husband, Ron. These two brothers-in-law are always up for something new and tasty, somewhere they can fill up, catch up on the latest family news and trade some borderline inappropriate "Dad" jokes. Look out, Barrie! One day, when my work schedule actually fit with their's, I joined the duo as they checked out a new place that had been on my radar for a while now. The Twisted Indian Modern Wraps opened on May 27th in the Duckworth Plaza and I have been dying to try it ever since. 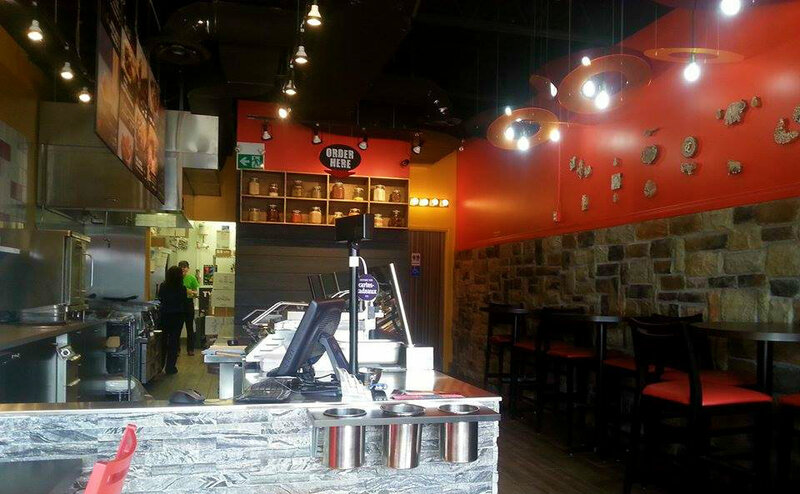 A sub shop model with all the flavours of Indian cuisine - yes please! Much like the way in which you begin your order at the big sub shop places, you choose your bread first - soft, fluffy naan or lighter roti. Next, you pick out a meat or vegetarian filling - keema, chicken tikka, pork sausage tikka, butter chicken, rajma or chana. Don't know what any of these things are? Not a problem. The friendly and knowledgeable staff are very happy to explain each item and give you a sample if you wish. Lastly, there will be some lovely fresh vegetables and creamy chutneys to choose from to finish off your wrap. 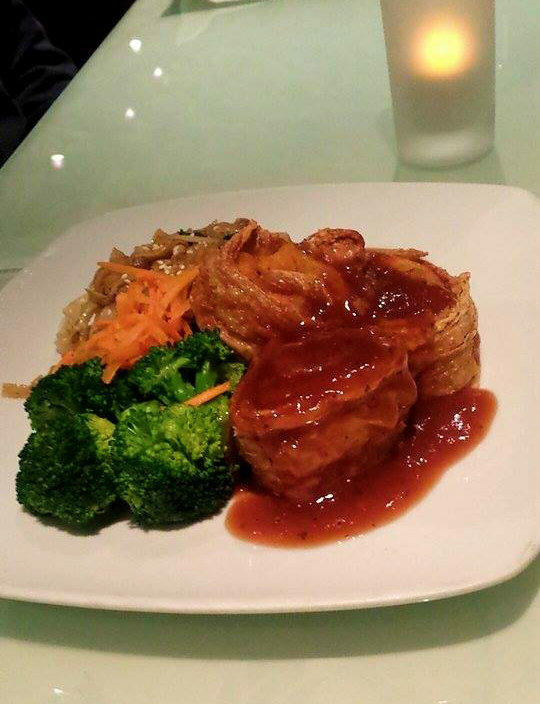 Make your meal a combo by adding samosas, masala fries or spicy poutine. When we were there, buying a combo meant getting a free daal (lentil) soup included. The Twisted Indian is as fresh and modern as the name suggests. Even from the outside, the storefront is appealing, new looking, contemporary and a nice pop of excitement in a somewhat tired looking plaza. Hey, where was this when I was in college and living around the corner on Sylvia Street? Of course, back then Georgian College had 3 buildings, Michael Jackson had multiple hits on the radio and Indian food of any kind was unheard of in Barrie. 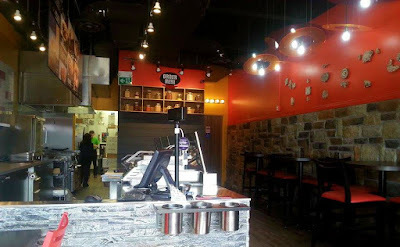 Inside, the look is rustic meets modern with ultra now light fixtures over stonework walls, bright red walls and displays of Indian art and jars of spices. It feels clean, exotic and trendy, casual and friendly. 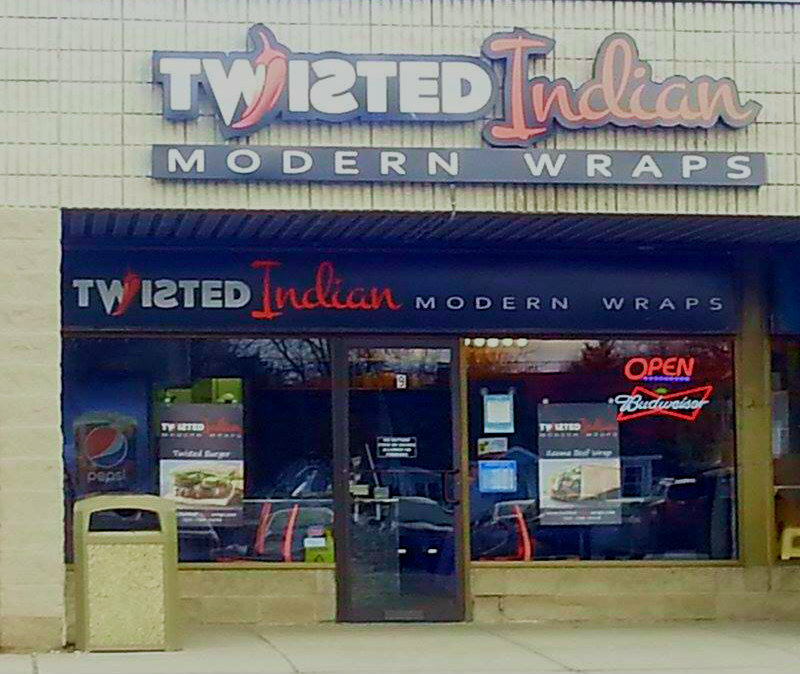 New immigrants and college students alike would enjoy Twisted Indian. And the food? Ohhh the food! The guys chose meat fillings. Ken - keema (ground beef with mild spices. Ron - butter chicken, (chicken in a mild tomato-butter tikka sauce) which must be one of the best dishes ever invented by anyone anywhere! I opted for chana, which is a mildly sauced chick pea stew. 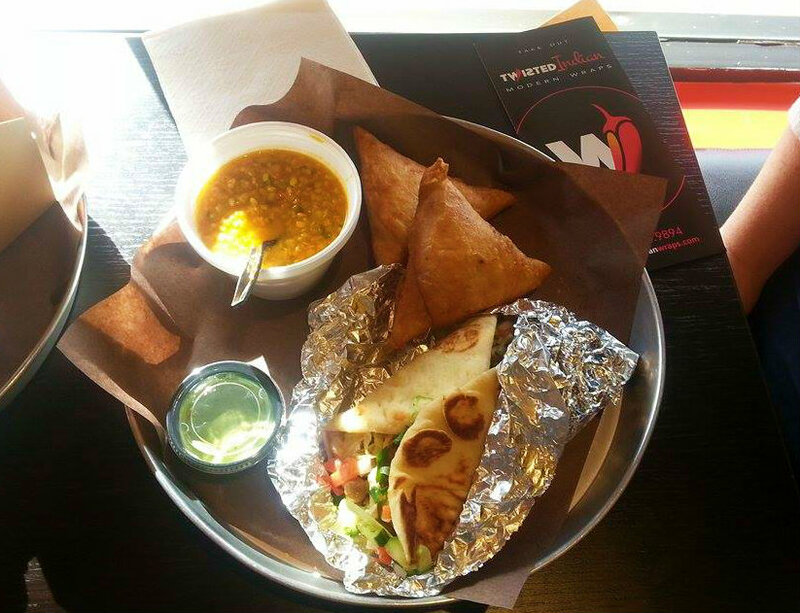 All of us ordered our wraps on naan bread, made combos with samosas and got our free daal soups. What a feast! As if the wraps weren't big enough, the samosas (you get 2) were the biggest samosas I have ever seen and such a soft outer shell - not over fried or too crunchy, just delightful. The daal too was beautifully done. 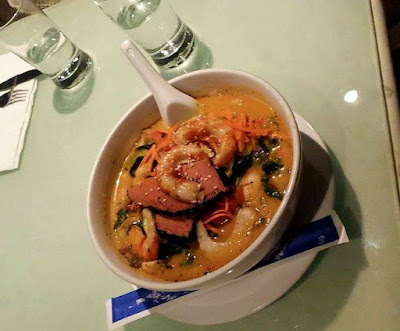 Not hot at all, but spicy in the sense that it was rich in layers of flavour, and mild enough to suit any palate. Our stomachs were far from empty when we left and happily our wallets were the same. This abundance of savoury delights was not at all expensive. 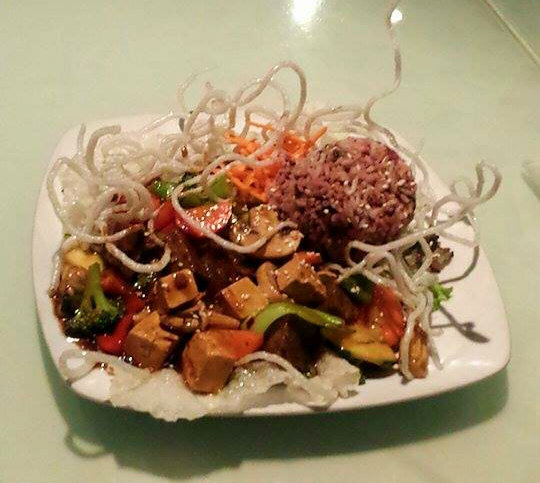 All house made dishes from the best of fresh ingredients, as the hostess/owner enthusiastically explained, were created with health and budget in mind. I would say that this little place must be a nice break from endless pizza and subs for the college students in the area. It certainly will be bringing me back to the east end of Barrie soon again.